The American Baptist Foundation (ABF) manages financial resources exclusively for our American Baptist Family and related partners. Funds are professionally managed and all investment partners have access to ABF's Strengthening Your Financial Future (SYFF) program. ABF promotes Socially Responsible Investments consistent with the values of American Baptist Churches USA. Investments exclude firms primarily involved in gambling, defense, tobacco and alcohol. Investment partners can choose the right mix to align with their investment needs. ABF computes a 20-quarter average to ensure stable distribution year over year. Investment partners can reinvest or select other distribution options. 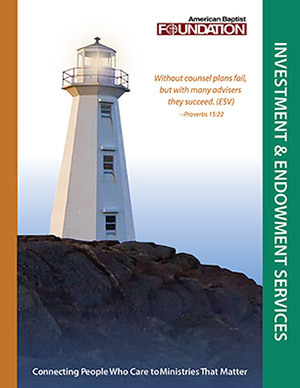 In addition to investment management, ABF provides complimentary program services aimed at providing greater support for ministry. What do you get for 62 basis points (0.62 of 1%)? ABF charges no front/back end fees or any other soft charges. Investment management fees are a flat 83 basis points. The Foundation respects the individual and organizational need for privacy. The Foundation does not share, sell or exchange your information.